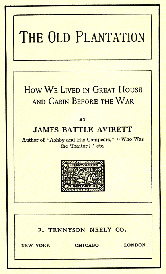 James B. Avirett (James Battle), 1837?-1912 The Old Plantation: How We Lived in Great House and Cabin Before the War. The Old Plantation: How We Lived in Great House and Cabin Before the War. New York; Chicago: F. Tennyson Neely Co., c1901. North Carolina -- Social life and customs -- 19th century. Plantation life -- North Carolina. Plantation life -- Southern States -- History -- 19th century. Southern States -- Social life and customs -- 1775-1865.